Have you ever paid attention to even the simplest of “customer journeys” you personally make? One of my customer journeys started in early February, when my husband alerted me he would be allowed to take some leave time between his changing military commands. Since we have had two children and a deployment in the last two years, “family time” outside of the home has normally involved a quick trip to the park or museum. But a real vacation?! I could hardly contain myself. I also felt I’d gotten in over my head pretty quickly – as I’d never taken a vacation that involved small children. And so, here I was, a prospect. And very soon I would be someone’s new customer. ENGAGEMENT BONUS: To ramp up for my vacation, I’ve engaged with the company as a fan on Facebook to keep abreast of events in the area and new rental opportunities for future trips. Since I’ve purchased, I’ve been bombarded with mobile and desktop display ads from vacation rental companies targeting me through Facebook and through apps and websites because of my behavior/search history. And knowing what I know about digital advertising, I should expect this for another 30 days or so. However, they’re unaware I’ve already made my purchase and their ad spend on me is for naught (unless they put it in CPC/PPC). being available virtually at a time convenient for me (not them) to answer my questions and close the deal. In this particular case, it was at no point about ad dollars spent to target or influence me to do business with them (I won’t say this is always the case). 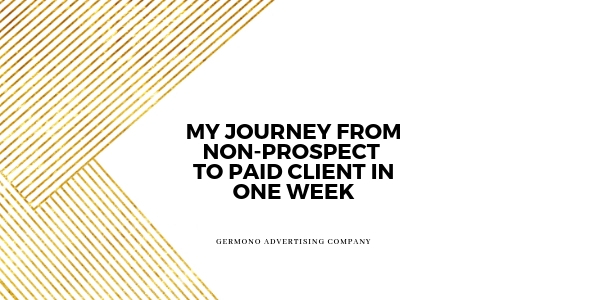 Moral of my story: Think about your customer’s journey – and how your internal and external marketing dollars are being spent in relation to that journey. Need help in this department? I’m happy to play the role of your prospective customer – and see if you get my business. Our marketing coaching sessions are an excellent resource, so schedule a free consult call with me today!